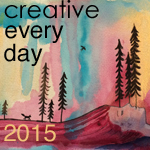 Ways to share: Once you've signed up, you can leave a comment on this post and/or use the "Mr. Linky" widåget below to link to a blog post(s) or flickr image of your creative activities during the days of 8/10/15 - 8/16/15. You can also take advantage of the great CED flickr group to post your images and see what others are up to. If you're on Twitter or Instagram you can use the hashtag #CED2015! Find us on Facebook here. Theme: August's totally optional theme is The Sea. I’ve been missing CED, so I’m just going to post what I drew. Sorry it’s not following theme.